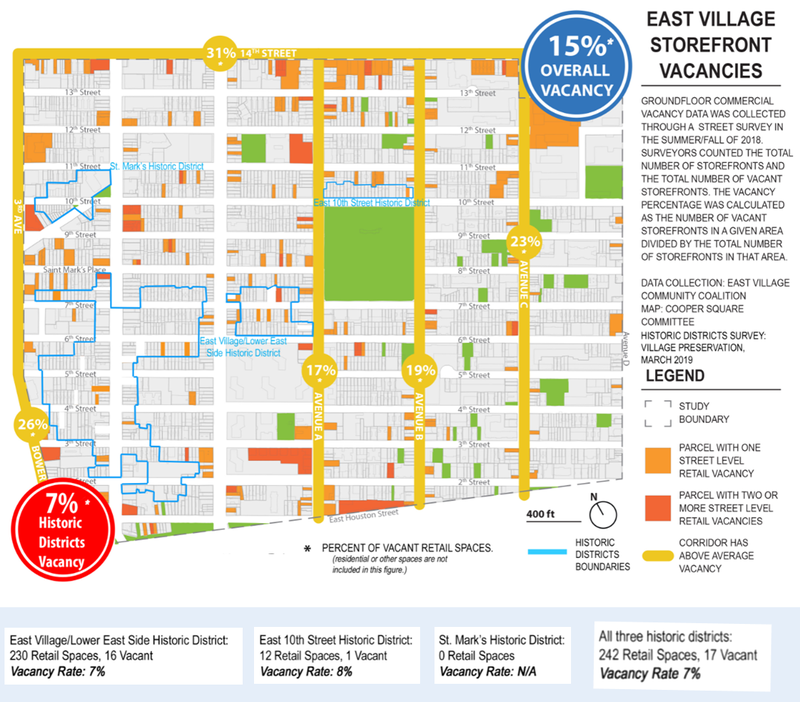 This week Village Preservation released the results of a survey (pictured above and linked here) conducted over several months looking at retail vacancy rates in landmarked areas and non-landmarked areas of the East Village. The survey found that the percentage of retail vacancies in landmarked areas of the neighborhood were less than half the rate in non-landmarked areas – 7% vs. 15%. This was consistent throughout the neighborhood – landmarked streets had consistently lower retail vacancy rates than non-landmarked ones, which sometimes ran as high as 31%. By contrast, the East Village’s three landmarked districts encompassing about 400 buildings had 242 retail spaces with 17 vacancies and a fairly consistent retail vacancy rate of about 7%. The East Village overall has about 2,200 buildings with 1649 retail spaces and 250 vacancies, or a 15% retail vacancy rate. The findings of this new apples-to-apples survey undercuts claims by the Real Estate Board of New York in a study it released last year attempting to imply that landmarking led to higher rates of retail vacancies. That study was based upon inaccurate data and assumptions, using a very limited comparison of one street in Hell’s Kitchen vs. a few cherry-picked streets in the West Village. This survey, by contrast, is the first neighborhood-wide survey of retail vacancies in New York City looking at comparable landmarked and non-landmarked areas. The survey was conducted by the East Village Community Coalition, the Cooper Square Committee, and Village Preservation. 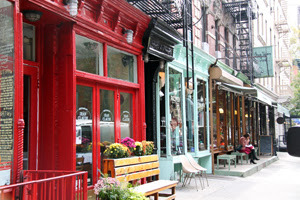 As part of its ongoing efforts to protect and promote small businesses, Village Preservation also runs a Business of the Month program (see below), and has been advocating for passage of the Small Business Jobs Survival Act and adoption of Formula Retail Zoning, which would limit the size, concentration, and placement of chain stores in areas which wanted such limitations (see more here).